FantasticStay is a powerful cloud-hosted platform for managing property and vacation rentals. It offers easy to use tools and automation capabilities that can be used by Airbnb hosts, vacation rental managers, and property owners for the management and distribution aspects of their business. With a single platform to handle and streamline all tasks and processes, you can free up your time, scale your operations, and realize more profits using the app. The software provides a single point of operation to manage and simplify your vacation rental and property business. With one hub for everything coupled with a robust automation engine, you can facilitate and keep tab of listings, reservations, availability, communications, payments, pricing, and staff schedules and assignments. Its deep integration with leading online payment services means your customers get a convenient and secure platform that can automate payment processes and eliminate manual credit card charging. In addition, FantasticStay comes with an intuitive website builder where you can easily create your own attractive and engaging website. It can extract all inventory information from your properties and intelligently build your online vacation rental website complete with availability, pricing, full portfolio listing and more, and is capable of receiving instant bookings and collecting/processing payments. Meanwhile, keeping track of your financials and getting important performance metrics is made possible by a solid reporting function that provides you with numbers that matter. You get one online location to run every aspect of your business. The software gets rid of you having to log into different websites to place ads on various booking channels or entering several Airbnb accounts since the software lets you manage and store all your listings from different vacation rental sites. From one dashboard, you have all your listings, settings, and information from across various rental platforms all within easy view and reach. You can even filter and organize them according to variables you set such as channels, titles, tags, cities, etc. Moreover, a listing calendar allows you to get a visual view as well as synchronize reservations, availability, pricing, and more across different channels so that you don’t miss anything. FantasticStay gives you a unified inbox that houses all communications with your guests. It’s where you can directly decline, approve, and answer inquiries; suggest another location or listing; send special discounts and offers; quote a different price; and keep connected with your team. Your complete communication history with your guests and your staff as well as with your other rental platforms is stored in your inbox. Conversation threads are neatly organized and can be tagged for easy searching, following up, and prioritizing. The inbox also has multi-user support to allow different login for each of your team members. The solution comes with automation tools and engine to streamline virtually every aspect of your rental business from listings to reservations, communication and reminders, to sending specific messages to guests regarding confirmation of bookings, and more. Core processes and peripheral admin tasks can be customized and automated based on your rules and settings. It improves efficiency, boosts productivity, saves you precious time and resources, and gives you full command and control over your operation. It even has an “email grabber” that automatically requests for the personal email address of guests, and saves it for future marketing and promotional activities. It likewise provides auto reviews consisting of pre-built review templates that guests can simply fill up and which the software automatically sends and posts to the relevant review channels. Automation is extended to payment processing. The software enables automatic processing of guests payments through its integration with top online payment services such as Square, Stripe, and Braintree. The fully automated and seamless payment processing system provides quick and secure collection of security deposits, accommodation charges, and other fees. All charges are consolidated with the guest’s reservation which can be safely refunded or debited based on your company regulations and existing policies. FantasticStay’s powerful reporting feature for your financials and key performance indicators helps you make information-driven decisions. It lets you compare your business performance vis-à-vis targets which can be filtered by listing, dates, cities, channels, and tags. You get to understand your listings on a portfolio level through deep analysis of a specific property, allowing you to work with the right metrics and assumptions so you can keep track of revenue goals and streams. You can follow and compare revenue by type and channels, occupancy rates, average guest count, average nightly rates, and cash flows, among others. You don’t need to hire a professional designer to come up with your own beautiful vacation rental website. FantasticStay is equipped with a website builder tool that automates extracting information from all your properties and easily creates an online site for your business complete with all the essentials such as pricing, availability, and full portfolio listing. With your own site, you can directly receive client bookings, collect client payments, avoid channel fees, and market your own properties. Your guests get to experience similar simple and efficient booking process offered by leading vacation rental platforms aside from having total control over customized stay rules and pricing. Are you too busy to personally manage communication with your guests? No worries. You can unload that task with the 24/7 guest communication feature where FantasticStay’s well-trained receptionists take over. They’ll handle communicating with your guests throughout the reservations cycle from initial inquiry to guest screening to 5-star review post checkout. It’s as simple as providing FantasticStay with all the needed information and they’ll handle the rest for you. What Problems Will FantasticStay Solve? Problem: You’re looking to streamline posting of reviews of your properties on Airbnb, Booking.com and other major vacation rental platforms. Solution: FantasticStay automates the process through ready-made review templates that guests can easily fill up. Once done, the system handles sending the reviews to all leading rental platforms and property review sites. Problem: You’re experiencing communication gaps and missing important messages from all other rentals channels, from your guests, and from your staff. Solution: FantasticStays’ unified inbox serves as your communication hub that stores and manages all communication and messages coming from various sources and channels, sorts and tags, and notifies you so that nothing slips through the cracks. Problem: You find it challenging to manage all your channels. 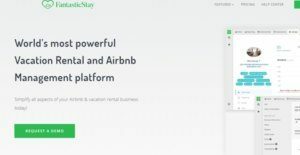 Solution: FantasticStay offers comprehensive channel management through integration with several (30 as of the last count) vacation rental listing sites. You can centrally manage all your listings, bookings, and reservations across various channels for more efficient operation. If you are interested in FantasticStay it may also be sensible to examine other subcategories of Best Property Management Software listed in our database of SaaS software reviews. Organizations have unique wants and requirements and no software application can be ideal in such a condition. It is useless to try to find a perfect off-the-shelf software product that fulfills all your business wants. The intelligent thing to do would be to adapt the system for your special wants, worker skill levels, finances, and other elements. For these reasons, do not rush and invest in well-publicized popular solutions. Though these may be widely used, they may not be the best fit for your particular needs. Do your homework, investigate each short-listed system in detail, read a few FantasticStay reviews, call the seller for explanations, and finally choose the product that provides what you require. How Much Does FantasticStay Cost? FantasticStay’s pricing is quote-based, with packages crafted according to your business’ particular needs and the number of listings that you manage. You can contact the vendor for more details. We realize that when you make a decision to buy Property Management Software it’s important not only to see how experts evaluate it in their reviews, but also to find out if the real people and companies that buy it are actually satisfied with the product. That’s why we’ve created our behavior-based Customer Satisfaction Algorithm™ that gathers customer reviews, comments and FantasticStay reviews across a wide range of social media sites. The data is then presented in an easy to digest form showing how many people had positive and negative experience with FantasticStay. With that information at hand you should be equipped to make an informed buying decision that you won’t regret. What are FantasticStay pricing details? What integrations are available for FantasticStay? If you need more information about FantasticStay or you simply have a question let us know what you need and we’ll forward your request directly to the vendor.